In today's highly wired world, automobile makers must continually be keeping up with emerging technologies in order to stay ahead of their competitors. Dodge does just this with its 2018 Charger. This popular sedan features the latest in technical innovations all designed to improve driving performance and passenger comfort. The optional Uconnect Voice Command and Bluetooth Streaming Audio systems work together to enable voice commands for a myriad of functions including navigations services. Discerning audio enthusiasts will delight in the BeatsAudio Premium Sound System, boasting ten amplified speakers and a 552-watt amplifier all partnered with a massive subwoofer. 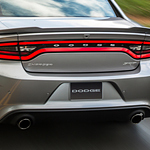 The Dodge enthusiasts at B & B Chrysler Dodge Jeep Ram in Honesdale are excited to share with you our knowledge about the 2018 Charger. Our team of professional associates is ready to answer any questions you have about this venerable sedan while we take you out for a test drive. We look forward to serving you today!